A few years ago I was casually looking for a larger boat and while browsing on-line, I came across what looked like a possible candidate. But I found one picture that told quite a story about the boat. Let's take a close look at it. Careful observation of the boat, motor, and trailer in this photograph can reveal some interesting insights. The first thing I noticed was the trailer. It looks like a decent trailer, if you like all-bunk trailers, but in this application the bunks are horribly fitted to the boat. They also look like they're welded in place. In their current location the bunks are positioned so that all the weight of the boat is taken by the tips of the chines, and none of the load is borne by the keel. This is totally at odds with the factory recommendation. The boat has no bottom paint, and from that I would conclude that it was not stored in the water, but instead spent a lot of time on the trailer. This makes the trailer set up perhaps a bigger problem. On the other hand, maybe the boat was dry stack stored, and the yard just set it on this trailer for the picture. At least you'd hope that was the case if you were the buyer. The second thing I noticed was that in the splash well there is a gallon container of an non-OEM oil. I don't think this is a huge problem, but it does give one a little insight into the history of the boat. Next, I was drawn to the relationship between the marine growth and the splash well drains. There is marine growth on the hydraulic cylinders that extends far above the drain height. The boat probably sits with several inches of water constantly in the splash well. You can also infer that the engines are counter-rotating from the opposing pitch of the propellers. Also, there is a nice view of the often-asked-about grounding electrode on the transom. Finally, I notice that there are cavitation plate extension added to the engines, in this case one foil per engine. 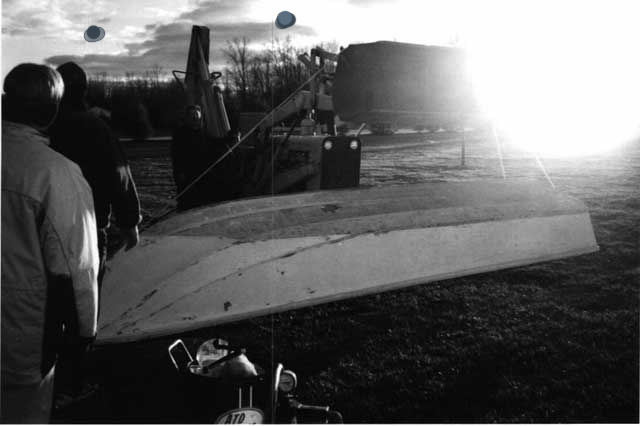 Perhaps the stern-heavy trim (revealed by the high water mark mentioned above) has required the installation of these hydrofoils to assist the boat getting on plane. The presence of only one foil per engine must induce an offset in the effect of drag on the engines. It looks like the engines would be under considerable force to turn into each other. At higher speeds I would guess that there is a substantial additional load placed on the steering tie bar from the opposing forces generated by the foils. If a bolt failed in the tie bar, you would be saying good bye to those lower units in the next millisecond. 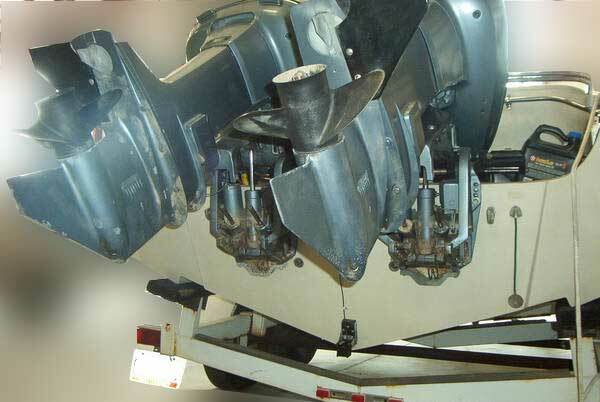 The mounting of the hydrofoils also interfers with the zinc trim tabs. If you need to drop the lower unit to service the water pump impeller you will have to remove the foils. That is quite a bit of information from a single uncaptioned picture! Fifteen-year-old Joseph Gedridge sent this amazing photograph to me some time ago. At first I did not appreciate what the image was showing, and I foolishly did not publish it. More careful study revealed the unique and amazing moment in time that was captured by young Joe in this shot. Strange Visitors from Another Planet? When I first saw this picture, I though it was simply a case of bad photography--the lens of the camera was pointed directly into the sun. But then I noticed the alien spacecraft in the western sky. A third spacecraft has just landed to inspect the Whaler at closer range. Radiation from the craft shows up on film as a bright light on the right hand side of the picture, obscuring its image and spoiling the color film. Note how everyone is staring at the space craft hovering to the west. Ohio is a hot spot for alien landings (Source Dr. J. Allen Hynek). "I am Joseph Gedridge and I am at 15 years of age. "My dad bought me a 1972 Boston Whaler Montauk. It was painted the wrong color and the original floor was taken off with a grinder sander to leave a crecent moon shape in the floor. The guy who had it before me painted it by hand, a pukish yellow, and the floor grey. It looked terrible. My father said that I had to take a disk sander and sand all the layers of paint off that boat. (This was September 2001 that he bought it for me). "So I began and started sanding after school. I would sand from 3-9 PM. The first night, I said "Dad, you have to help me!" His response was "I sanded the bottom off of my 33-foot Pacemaker on my back!" I took that as a big NO, he wouldn't help me. "When we bought the boat it had a small crack in the bottom. We took the engine off, sent it to a guy to get re-built (70 HP 1984 Johnson). We took the console out, too. One month and about 500 sanding pads and 30 dust masks later, I came across the [stencil] serial number, 35208. I sent it to Boston Whaler via e-mail. They said "Oh, that is not a 1972, no, that's a 1966 Nauset." (I forgot to mention that when I was sanding, it had a blue interior.) We thought we had bought a 1972 not a 1966--that is fraud so you could imagine that I was hot after that. But what can you do? "After sandblasting, I gave the hull a light bottom sanding with a Porter Cable Sander. We sent it in January of 2002 to a place called Express Marine and he painted it Desert Tan with light grey on the outside, along with a proper bottom put on it. I figured it wouldn't look right having a blue interior and a fiberglass console. Three weeks later it was done and the paint is curing in the back of the barn of where I was sanding, and cleaned up also! "Now it's March 7, 2002, and the paint is just about done curing. Our next door neighbor, who refurbishes old Lymans, is going to trim my console in teak. After that I will put the rails on, install the console, and take it to the guy who is doing my engine to hook everything up, the Throttle Cable and all the stuff that has to go on there. "Please excuse the black and white photos, it's the scanner. It has not worked right since the spaceship landed. "I thought you might find this photograph interesting, perhaps even interesting enough to use in a future Cetacean Gallery. Where I moor my Boston Whaler 15-GLS and tow boat, this "big whaler" is also moored. Granted it's a fake, but it's still interesting. It's a 38-foot Custom, which from what I understand was designed by Bill Garden (a very famous designer in these parts), and made by Canoe Cove Yachts in Sidney, British Columbia. It was built in 1981, and her twin diesels power her up to a 20 knot cruise. Touted as a 'very good rough water boat.'" 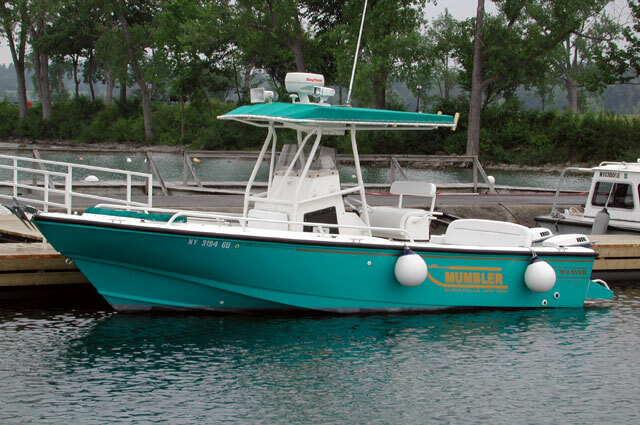 This custom built 38-footer has an uncanny resemblence to the c.1970 21-Outrage hull from Boston Whaler. It was built in 1981, so one assumes its lines were influenced by the "outrageous" classic Whaler. Boston Whaler enthusiasts are always looking for that needle in a haystack, an older boat that has been kept in a barn for years. They search for these old gems, kept safely indoors and out of harmful UV-rays of sunlight and corrosive salt water. 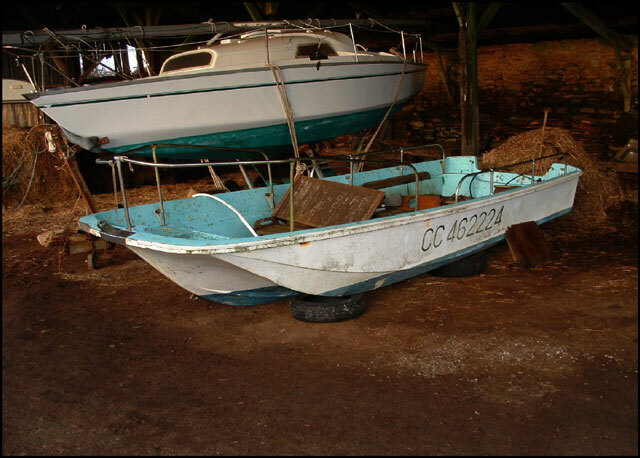 Here is a barn-stored Boston Whaler, but I don't think its condition is exactly what most are looking for. 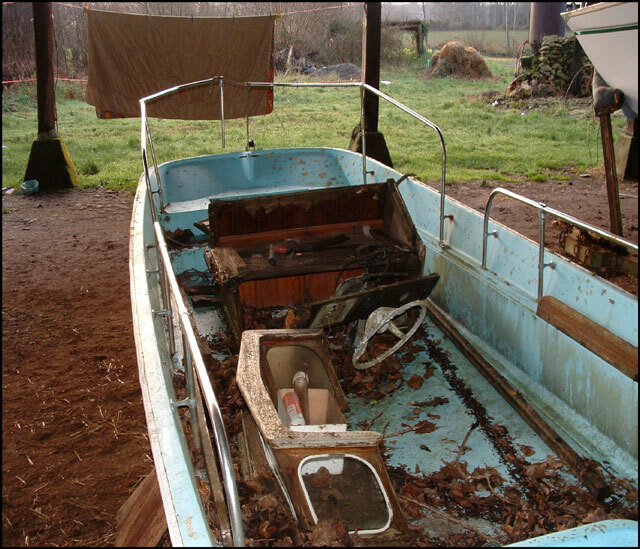 From France we get these images of a boat that needs a little work. Prospective buyer Erwan Le Bourhis ‹teddington-sud©wanadoo.fr› wrote to me asking for help in identifying this boat. The stencil number is 30863. It looks like a NAUSET model, probably made in 1962 to 1963. Thanks to Jim Coloross and Joe Kriz for converting the images from an impenetrable proprietary Microsoft format to a standart JPEG that I could see and use. From the large ID numbers on the hullsides, I suspect that this 41-year-old 16-foot hull may have previously been in commercial service. It has ended up for sale in this barn in France. In spite of its current appearance, restoration is still possible for the dedicated. The hull seems to be in decent condition. All the major components are still here, except for the seats. Careful use of rotted wooden components as templates can permit a restorer to make new ones. Most of the time we anticipate a Boston Whaler hull to be constructed with gel coat colors of white, gray, or desert tan. Here are a couple that don't fit into that mold. "The boat is slipped at the Skaneateles Country Club on Skaneateles Lake which is one of the Finger Lakes in central New York. It's a 1996 Boston Whaler 24-Outrage with twin 175 HP Evinrude Ocean Pros. I bought it from Russo Marine in Medford, Massaschusetts from the original owner. They told me it was one of four built for the West Palm Beach Boat Show. Russo took one boat to Medford until it was sold in 1998 (the teal color seemed to be the problem!). "I remounted the radar on a ScanStrut to clear the new Hailer, and ARC 100D Search light. Those rails are called 'low rider' rails as seen on the Coast Guard boats from the Commercial Products Division. The boat has a bow dodger (or forward shelter), too. To date I have not heard from any of the other owners of the other three hulls in this color--this article just might do it. Thanks again, Walt"
"This a recent acquistion. Its home was in Connecticut until I moved her to south Georgia. I did launch her to see how she handled. She has had very little water time and is in near mint condition. She was purchased new at a Stamford, Connecticut dealer by a gentleman who died rather shortly thereafter. The boat sat winterized but covered for several years. 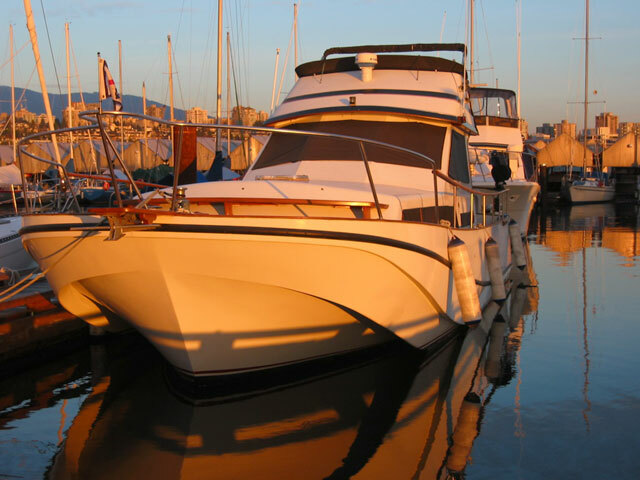 "A friend of the widow ultimately purchased the boat, and also used the boat very little. Upon his retirement and move to Florida, he gave the boat to his son who used it two times. I was lucky enough to locate her through the father, and found the son probably would sell her. We struck a deal, and now she is mine. "I intend I doing more research about the total number of these that were made, as I realize this is a 30th Anniversary Model, and that the RED is RARE. 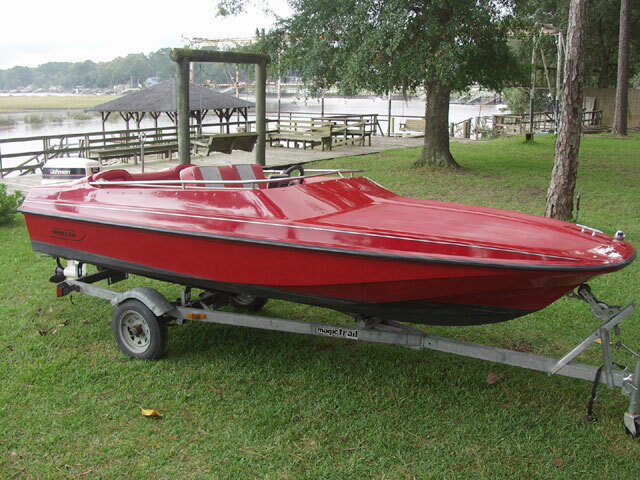 Sorry I have not included pictures of myself, and or family members, but The Little Red Boat is just too pretty. "The front seats are not original to the boat, but I have the originals, and have to restore one seat before reinstalling them into the boat. The hull is almost flawless inside and out. No fading as it has always been either covered or stored in doors. I have yet to clean in completely. The discoloration on the deck is dried wax." For promotion in Boston Whaler's 30th year, the factory turned out these unusual red gel coat Mischief models. Built on the terrific 15-foot hull, these were sporty go-fast boats with more interior comfort than the usual wooden thwart seats. Don't forget there is a FORUM section for follow-up comments on these CETACEA photographs. Please feel free to join the discussion. Please note that the email addresses shown have anti-SPAM elements to prevent them from being picked up by web crawlers; please make corrections before emailing these owners. If you would like to contribute some images for inclusion in a future CETACEA collection, please read the guidelines before sending. The page has been accessed 54701 times. This article first appeared May 25, 2003.